Edinburgh-based independent bottler Wemyss Malts is launching a new limited edition blended malt whisky finished in Madeira casks. Bottled at 46% abv, Nectar Grove is naturally coloured and non-chill filtered to ‘retain the intensity of flavours and aromas’ in the whisky. ‘We are delighted with the results of our first “finished” blended malt,’ said William Wemyss, founder and managing director of Wemyss Malts. The whisky, a blend of Highland single malts, has been ‘imbued with the fruity and complex sweet flavours of Madeira wine’, with a ‘gentle oak spice and sweet pastries’ finish. Nectar Grove is said to be ideal as an ingredient in a whisky cobbler cocktail thanks to its notes of ‘peaches, nectarines and citrus’. The packaging was inspired by Portuguese ceramics and fretwork due to Madeira’s heritage as a Portuguese island. 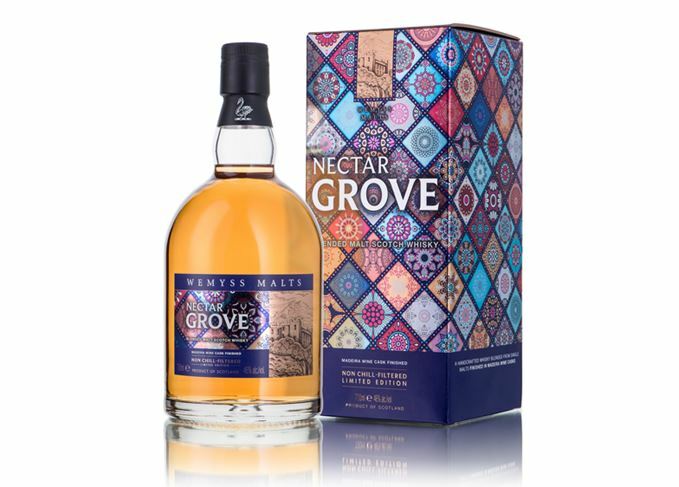 Only 9,000 bottles of Nectar Grove will be released to the public in the UK, EU and Asian markets at an RRP of £43.95. Annual blended malt releases will look at the various influences on whisky flavour.